Will the Phantoms even be in the running by the time Ghost comes back? The B-Sens took another game from the Phantoms on home ice Wednesday night, and although the home-town team got a point out of the deal, it didn’t feel nearly that good after blowing a 2-goal lead and, twice, a 1-goal lead. After giving up 3 goals in 38 seconds one time, the Baby Sens sure have made themselves comfortable in downtown Allentown of late. The Phantoms have now lost 5 games in a row on home ice, at the PPL Center in Allentown. The Phantoms are in 10th place in the conference and need to be top-8 to make the playoffs. With 54 standings points, the Phantoms trail 9th place Portland by 3 and 8th place Worcester by 4. Tonight’s opponent, the Providence Bruins, are in 7th place with 59 points–and the Phantoms have a game in hand on the Boston-affiliated AHL team. For this game it’s not only important for the Phantoms to get the two standings points that go with a win, it’s important for it to happen in regulation so that the Bruins don’t get any points at all for their own position in the playoff race. With my ear to the ground around the AHL, I’ve noticed fans from other Eastern Conference teams are hoping the Phantoms don’t make the playoffs. With the recently returned Laughton, Powe and Alt–and with Gostisbehere and Jones on the way–and with an experienced playoff goalie in Zepp…They feel we could be formidable–even as the eighth seed. The Phantoms have dropped to fifth in the attendance rankings, in large part thanks to our excess of mid-week home games. Let’s take for example the Hershey Bears–tops in the AHL in attendance. The Bears not only have a larger arena, but also only 9 mid-week (Tues-Thurs) games, with only 3 being at home! The Phantoms, by comparison, have 15 mid-week games, with 11 at home. I’ve opined about this before; I know there may be travel and scheduling reasons for the disparity. However, I do think I’d be aware of it if I were Mr. Brooks or Mr. Brooks. Let’s hope for a more equalized schedule for next season. Eight more games on weekends rather than mid-week is a tremendous attendance advantage. Jason Akeson continued his point streak two different ways Wednesday night, and by my observation, played a better team-style game, to boot. He was a willing chip and chase forward, as well as a willing passer and was also willing to take a shot so that his teammates would get a chance for the rebound. Nick Cousins and Taylor Leier both took huge hits near the end of the game Wednesday night. Both appeared fine; I haven’t heard anything. That’s got to be a good sign. Cousins got lit-up in the middle of the ice while he was looking in the wrong direction. Leier got checked into the bench area where the glass starts at section 106. Kevin Goumas was back on the ice for Wednesday night’s game. He centered the fourth line with Darroll Powe moving to the wing. I thought that line played well at times. The line I haven’t been as thrilled with, Rosehill-Fyten-Hextall, also played well. They generated some nice push and some nice buzz on the ice Wednesday night. Hextall and Fyten both had quality chances at the net but couldn’t convert. Rob Zepp remains “A traveler of both time and space” in Philadelphia; young Anthony Stolarz is our number one net-minder at this juncture, with Martin Ouellette backing him up. I’d expect Stolarz in goal again tonight. The Bruins’ affiliate comes to town for the only time this season. As detailed above, this is an important game for the Phantoms to win–as well as an important game to prevent the Baby Bruins from gaining any standings points. Kinda like a playoff game, wouldn’t you say? The Phantoms will visit Providence on Friday, March 13. Game Time: 7:05PM Puck Drop; 6:00PM Doors; Chickie’s by 5:00PM if you want a table. Tickets: This game has gone “SRO,” which means tickets are now very limited. I recommend pre-purchasing before you head downtown tonight. Also, as of this writing, the two VIP seats are still available. See the PPLCenter.com web site for details. You must purchase both seats to get the package–I believe there are only two available for each game. Parking: The “Arena North” lot–Linden Street entrance–is now “pass only.” However, you can purchase a pass by clicking here. Or, just search out the appropriate link from PPLCenter.com to see if parking is available to pre-purchase. Please note: Pre-purchased parking will cost you more because the arena will add fees. Weather: It’s cold and windy. Dress appropriately and maybe come downtown a little early to warm up with a bite to eat and a nice beverage–perhaps a hot toddy. Broadcast: TV-2 Service Electric Cable; AHL-Live pay package; AM-1470; FM 89.9 (arena only) or on the web via the 1470 site, the Phantoms site, or IHeartRadio.com. I had my radio Wednesday night and could listen to both the 1470 feed as well as 89.9 from my seat in 106 under the over-hang. 89.9-FM came in loud and clear and was a pleasure to listen to during the game. Promotion: None. But the Phantoms will be wearing their orange alternate jerseys tonight, so I’d encourage you to wear orange as well if you have an appropriate jersey, sweatshirt, or T-Shirt. Watch for that “playoff hockey” intensity. Watch to make sure that “intensity” doesn’t substitute for out-of-control and penalty-prone play. Watch to see if the officials are calling a fair game. I think the Phantoms have themselves labeled as a “dirty” team, and the officials are just looking for a reason to blow the whistle–where they are less likely to do so on the opposing team. Watch to see if Anthony “Stolie The Goalie” Stolarz can rebound with a strong home game. Certainly, his defense left him out to dry a couple times Wednesday night, but I also thought Stolie didn’t have his best game, either. Watch for my buddy DiPro. Nobody’s seen him in quite some time. Does he even exist? He may make an appearance at tonight’s game. 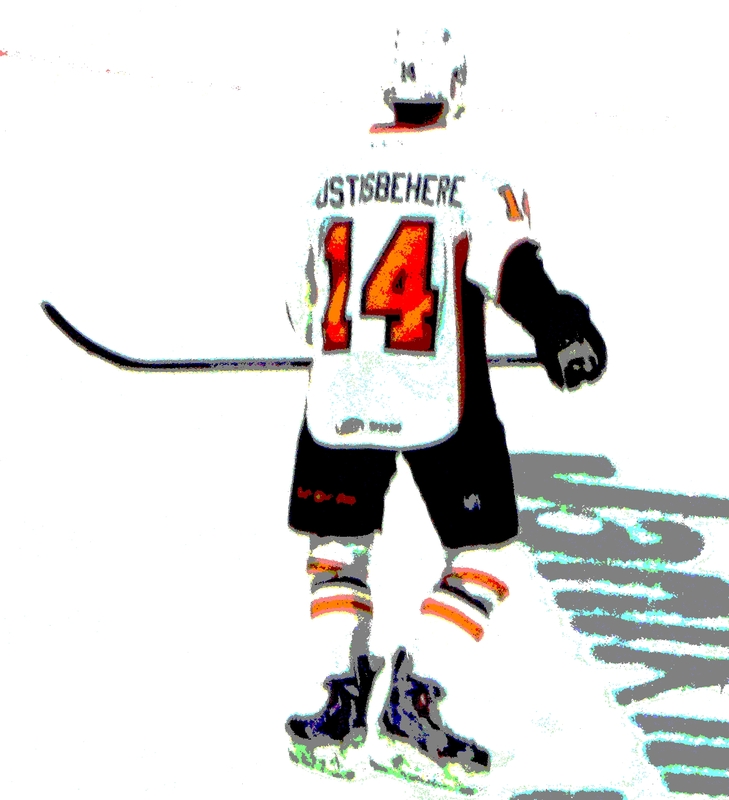 Watch to see if the Phantoms can capitalize on their chances. I did feel like they had their quality shots Wednesday night, but just couldn’t get the biscuit in the basket. The Sens were trailing and always take a ton of shots, anyway, so I’m not really concerned that they were out-shot. I was looking for quality chances and I saw them–their goaltender did fine but wasn’t standing on his head. Our shots weren’t finding their mark, and they need to. Look for that Laughton/Leier/Gordon line to get back in the swing. I thought they were a little quiet the other night. The Phantoms are back at it again tomorrow for a “Legends Night” with Frank “The Animal” Bialowas, as the Hartford Wolfpack returns to Allentown. That game has also gone SRO, so get your tickets now. The Players will then have some rest–days off at home. They’ll play again at home a week from tomorrow as the Binghamton Senators once again stop by to beat us on our home ice. That will be Little League Night.